Summer is the best time of year in western Washington. The weather is a beautiful and comfortable 75 degrees (or somewhere around there) and everything is great. I was home for a family reunion last week and the night I arrived, one of our beef cows calved (had her baby) and another calved Sunday evening. I love baby calves! Beef or dairy, it doesn't matter. They are all adorable. Our first new addition...isn't she cute?! 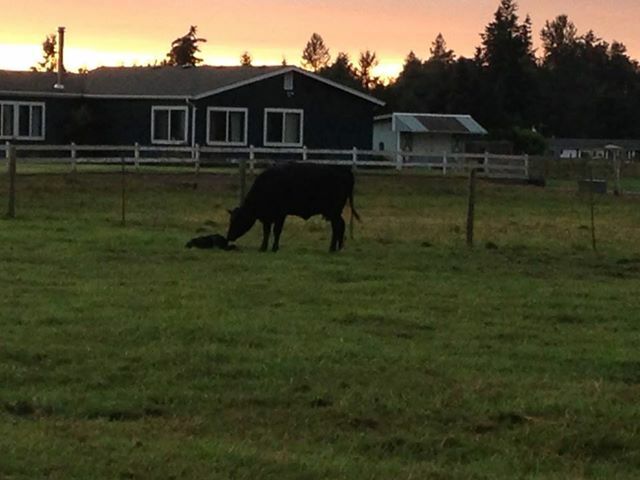 The first baby moo, Darla, running after mama. Darla and mama hiding by the boat. Grandpa says the baby moo wants to go for a boat ride. Our second baby moo, Alyssa, just after she was born. Mama is licking her off. Mama was calving when my brother and I got home that night, so we went out to check on both of them to make sure baby was breathing and doing okay and that mama wasn't having any complications, especially since this was her first calf. Both were and are doing great. The black cow on the right just calved in the last day or so since I left Washington. It's a bull calf. We haven't named him yet. I never get tired of this view from the farm. It's hard to beat that view of Mount Rainier. Love it! Two of the many reasons I love a trip home to the west coast: I get to hang out with two of my favorite guys, my brother and Grandpa! I love how farming brings families together. Here we are standing in front of my uncle's blue New Holland tractor...the tractors just keep getting bigger and bigger.